At first glance I thought the bowls were made out of plastic, because they were pliable and strong and yet had an almost machine-like finish. Ivan explained that these bowls and cups were made from a Calabash tree. He went on to tell me that years ago in Panama almost everyone served salad, rice or corn from these, but with the advent of cheap imported plastics, the knowledge of how to make these unique containers has all but disappeared. He still knew of one woman near the town of Concepcion in Chiriqui, that still made them, and so we went in search of one of the last artisans in the Totuma craft. Ten minutes west of Concepcion is the small hamlet of La Colonia, The paved road ends at the local school and there you take a short drive down a rough country road. Before we started on the road, Ivan spotted several calabash trees by the side of the road. He pulled one down and handed the large green fruit to me. 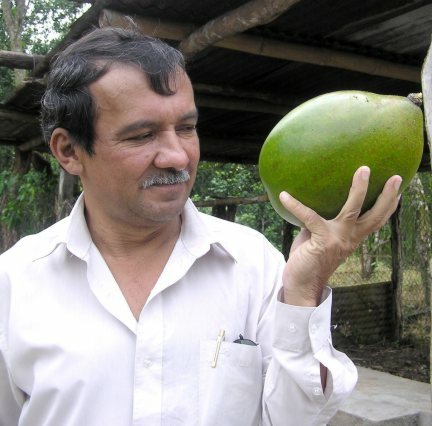 It resembles a large smooth avocado, but the most striking thing is the toughness of the skin – it was as hard as a coconut. A few hundred yards down the road we came across a small group of buildings. Smoke was rising from a traditional stone fire called a “fogon” and a man was sitting on a low stool shucking a huge pile of corn. Then Ivan introduced me to 55 year old, Enidina Saldana. She still makes and sells the calabash bowls and was happy to show us the process. 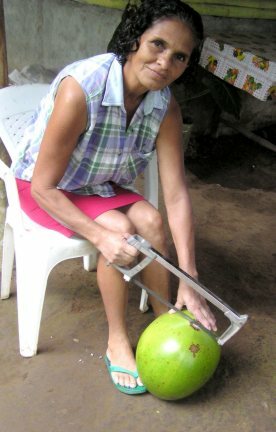 First she takes a plumber’s hacksaw and cuts through the hard shell of the fruit. Then painstakingly, the pulp is removed with a large, metal cooking spoon. This process can take between 6 and 8 hours. When the inner and outer skin is scraped smooth – the job is finished. The totuma is ready to go without the need for sealing or varnishing. Incredibly for all her hard work, Enidina only charges about $1.50 per large bowl. With regular cleaning these durable cups and bowls should last twenty to thirty years. 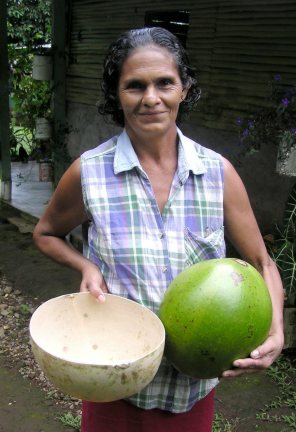 Life for her and family is simple – they do have electricity, but they draw water from a well and most of their essential foods grow within steps of their home; including plantains, oranges, corn, yucca, sugar cane and sweet peppers. I asked Enidina what foods they couldn’t grow, she smiled and said, Rice of course.” She went on to say that we use too many chemicals in our lives, in her area, things like breast and prostate cancer are so few that it hardly needs mentioning. The healthiness of this lifestyle was evident as she introduced us to her ninety-year old mother. Still, fit, walking and with clear mental acuity. Totumas, have another quite surprising application and that is as a locater for underground water. Friends tell me that their builders placed a dozen or more totumas overnight, face down on the ground. Next morning they turned the bowls upright and below the bowl that had the greatest amount of moisture – that’s where they successfully dug a well. 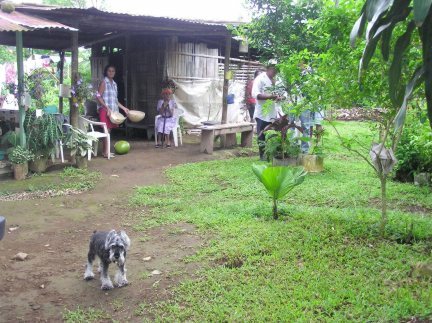 Totumas, are more than a tourist curio, they, and the people who still make them can be a great source of practical wisdom. 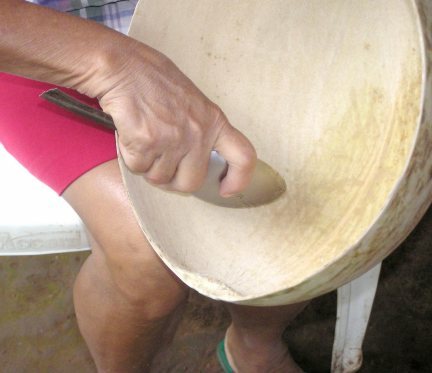 In Panama we should take great care to ensure that our old crafts and ways are not forgotten.